Added checboxes for ALL camera settings, so that we can only alter the parameters we want for each event. Added camera parameters for craft stations, style stations, and when lockpicking. Removed "Steal only when hidden" tweak (it didn't belong in this addon). You can check Azurah for a better one. Minor other code and settings modifications. Removed “Dialog Tweaks”. Check my other addon NTak Dialog to keep that functionalities (and much more!). This addon includes many camera features to enhance the game experience. Gain total control and enjoy all the world using the camera settings you want (force first or third person, camera position and zoom), depending on what you do. Use bindings to center camera or to swap shoulder. ⋅ Configure your camera settings for each “event” and it will automatically change: riding, stealth, combat, draw/sheath weapon, werewolf. It could be nice to have a key to easily change the camera horizontal position, don't you think? These bindings are made possible using Emacs! Camera preferred parameters: distance, field of view, and horizontal/vertical position. It overrides the regular camera settings. Prevent any camera change on interactions : talking to NPCs, using craft stations, lockpicking, reading, siege. That really is better for immersion not to change the camera on each interaction! You can't imagine. For example, when you talk with someone, the camera won't focus on them. Use your own camera settings when in interactions. Automatically change any of your camera settings when "events" occur: chatting, mounting, in stealth, wielding weapons, in combat, in werewolf form. Preset can be picked between: None / Center camera on 3rd person / Switch to 1st person / Switch to 3rd person / Custom (Do what you want). Get feedback from users Don't hesitate to comment or to ask for a new camera feature! Added checboxes for ALL camera change settings, so that we can only alter the parameters we want for each camera change. Enhanced debug events mode for future. Added some icons in the options. Added werewolf event to change camera. Correction of a bug I've added in last version. Added French and German translations. Added an option to prevent auto-steal-loot when not hidden. Added slash command "/ntakcameraevents" to log triggered events (useful for debug). Added additional vertical offset functionnality in event-driven camera changes. Added events to change camera parameters when drawing or sheathing weapons. I'm already aware of an issue with that, but I had to release anyway. I'll make some adjustments shortly. Finally managed to create a custom transition from/to center that doesn't cause a jump in the animation. Corrected a bug occurring when there were multiple events at the same time (or right after each other). OMG it's perfect now ! You did so many Quality of Life fixes with this! I'd recommend this to anyone honestly! I hope you'll do, ahah! Last edited by NTak : 04/17/19 at 02:57 AM. So that we can only alter the parameters we want for each camera change. You must have to redo some of your settings ! Last edited by NTak : 04/15/19 at 01:47 AM. To start off I gotta say i absolutely LOVE this addon. It adds so much more to the gameplay when the camera changes to different angles depending on what action you take. Now i noticed that most of the time (though not every time), the camera will stay at 0 or move back to 0 when I go back to the standard view when the option "restore preferred camera instead of previous" is on. I noticed someone else already posting something similar earlier which you said to have fixed, though maybe in the latest build this got bugged again? With the option turned OFF it tends to stay correct, however still resets sometimes (hard to say when). After exiting the game & logging back in it seems i have to adjust the values again for it to stick throughout the gameplay. Sorry to hear you're experiencing this issue. I do know something strange still happens from time to time. I also do know that it seems to mess only with the vertical offset. There are 2 vertical offsets : when on shoulder, and when in center. - “ /\ ” is the triangle created by my function to transition from the shoulder to the center. The pointy end is the value of “Vertical offset in center”. So, currently, the vertical offset that will be applied depends on both the “Vertical offset …”s and the horizontal position. But… Why did I do that? 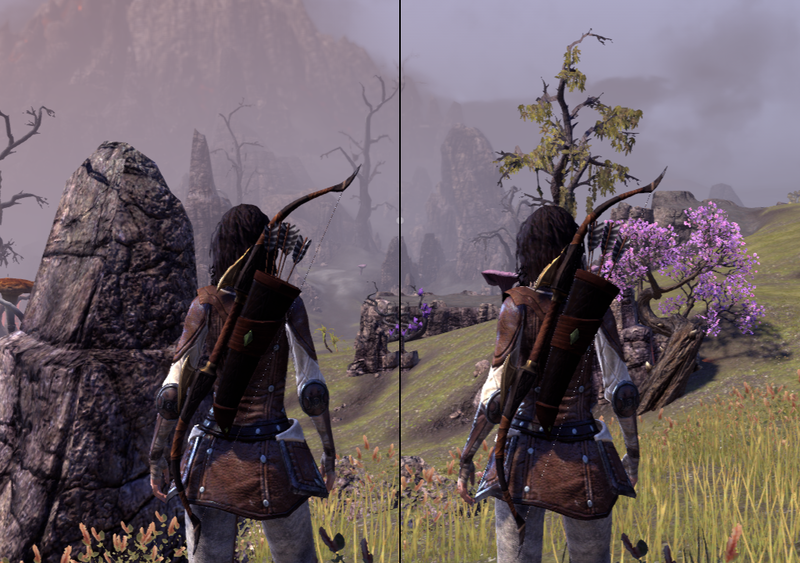 In the “Settings / Camera” in the game, if you set all the vertical/horizontal offsets/positions to 0, and play with the horizontal position slider, you can notice there is something that adds some offset when near the head. So, I made this function to reproduce that behaviour. To prevent this behaviour, you can set the two “Vertical offset …”s at the same value. That way, the function will always return a flat line “ ______ ”. Anyway, I know that complicates things for not much. As it was not explicitly written somewhere, I think that no one noticed that there was this triangle. So, this vertical offset management will be modified and the function simplified to something like “ __|__ ” in 2.0. As I'm working right now on 2.0, I can tell you that it will be released soon. It will change a lot of things that should make it more simple and efficient. For instance, it will be possible to only alter ONE camera parameter for an interaction/event if we want to do so. Today, if you modify the horizontal position of you preferred camera, you also need to modify the horizontal position for each of the interaction/event where you were using the same value… With 2.0, you won't. Plus, it will now include “Field Of View”! Edit: I've found what was causing the “reset to 0” when loading preferred camera and corrected it. Last edited by NTak : 04/13/19 at 08:47 AM. Due to big changes in 1.11, you may have to redo some of your settings! PS: You'll need to redo much more when 2.0 will be out! Last edited by NTak : 04/09/19 at 02:27 PM. I'll see if I can figure out the details of why. Here is what I observe when I have your mod in 3rd person for vendors and Bandit's tweak in his settings to stop the introduction dialog when you press E to engage a NPC vendor. It just bypasses the selection to use the vendor and goes straight to the vendor screen. The camera flys between first person view and third person view non-stop until I hit esc to break it. At the settings screen I change yours back to first person and everything is fine. Also unless the guild trader issue can be resolved I won't be using third person in the NPC interactions. I really need that history feature. Edit: Here are some links to videos I made of the problems. I figure it's easier to show than explain. That's amazing you took the time to make videos of the problems. That seems to be a quite interesting loop problem! N'Tak' Camera: “Noo, I don't want that interaction camera”. So, for me, the problem lies in Bandits UI, because it seems to (re)launch the activation of the interaction camera. Why is it doing that? Anyway, you gave me the idea to auto-open stores when visiting them. I'm gonna add this feature in my N'Tak' Dialog soon. As you can see, I haven't got the problem. Plus, I didn't code anything at all concerning the "recent searches" window or talking specifically to a guild merchant. So, there is no reason it is due to my addon. My guess is that another addon is somehow hiding and altering the "recent searches" window and waiting for the camera change event to display it back. But as I prevent it, it doesn't! So, I'm sorry but I don't think I can correct these. I could add a condition for the "vendor problem" to prevent the camera to switch several times, and finally use the interaction camera if another addon forces it. But that is not the source of the problem. Did you try asking the author of Bandits about those issues? I'll see if I can pinpoint the guild trader one then. If you don't experience it then it must be another addon. Also if you incorporate the auto-open feature I won't need Bandits to do that anymore. Last edited by NTak : 03/31/19 at 01:54 AM. youtube is still processing them atm so they may not show right yet. So if I use Bandits tweak to stop the initial dialog with vendors and banks, ect and I have this mod to show these interactions in 3rd person it goes into a infinite loop and can be broken only with esc key. Changing this mod to 1st person stops it from happening. 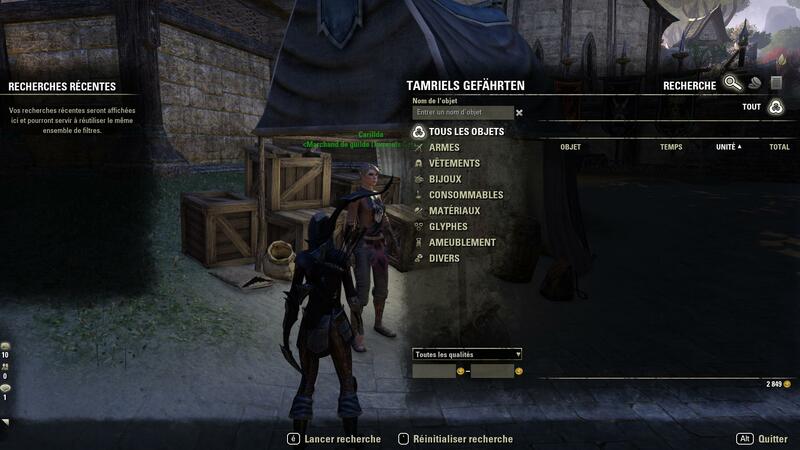 Another thing, when I interact with guild traders I lose the history panel on the left unless I switch back to 1st person. I don't use Bandits tweak, what do you mean by "stop the initial dialog" ? I'm using both my Camera and Dialog tweaks (obviously ) and didn't notice any of the issues you described. Last edited by Tigertron : 03/30/19 at 04:17 PM. Changing FOV is a nice suggestion. If it's possible, I'll do it, sooner or later! Last edited by NTak : 03/30/19 at 05:55 AM. Last edited by NTak : 03/29/19 at 08:22 AM. Could you please go through the district doors and comment here to tell us what happens? Last edited by NTak : 03/19/19 at 02:58 AM. Re: Disconnect in Imperial City Doors. Amazing mod! I have one issue though and its very weird. You're right, that's a very weird issue ! My addon can't "disconnect" or whatever. It only manages the camera. I don't know what can possibly happen. You don't have any "lua errors" ? Could you try the following scenarios? 1) After launching the game (with my addon installed), on the character selection screen go to settings/extensions and make sure that you uncheck my addon. 2) In game, go to settings/extensions and make sure that you uncheck all addons except mine. Sorry to hear that you're encountering that weird issue. And thank you for your feedback, as I don't play werewolf I was waiting for someone to tell me if it was correctly working. I don't have access to Imperial City, I won't be able to see the issue by myself. Last edited by NTak : 03/19/19 at 02:56 AM.